Price reduced to sell this spring. She has not been in the water since her topsides and bottom were painted. She has had very little use and is available do to a change in the owner's plans. The engine (70Hrs) and sails look new. Reasonable offers are encouraged. The Hunter 410 is designed to take you anywhere you want to go in comfort, convenience, and safety. Her large user friendly cockpit, her spacious 2 stateroom interior, her electronics package and her in mast furling sail plan make her user friendly cruiser that will comfortably accommodate 6. You must see "High Maintenance" if you are looking for a clean, capable and affordable modern cruiser. She is stored on land with the mast out for easy shipping. She is located very close to 2 major international shipping terminals. 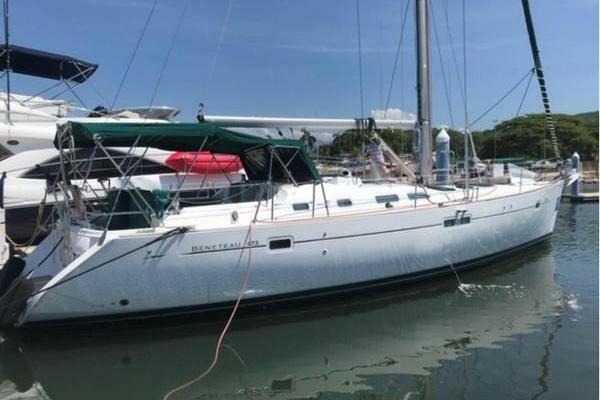 She is also available with the option of a slip at an upscale Rhode Island marina.......buyers keeping their vessel berthed in RI are not required to pay sales or use tax. Please see full specifications for additional information and photos. AccommodationsThe spacious salon includes everything to make cruising a comfortable experience. Plenty of hatches and ports keep the salon bright, airy, and well-ventilated. A seperate nav station houses all of the electrical panels as well as providing space for electronics. Aft you'll find a master stateroom that features a queen size berth, hanging lockers, and incredible storage capacity. This is a walk-through cabin that allows direct access to the aft head or the main salon. Going forward the full-size double stateroom features a pullman plan berth, many hanging lockers and drawer storage, and an ensuite private head. GalleyThe heart of the home, the heart of the boat, this gormet galley has all the features of home. It is open, light, and has all the opening ports and hatches to keep the cooking vapors out of the cabin. Ergonomics play a major role in fitting a lot of gear while keeping your guests comfortable while at sea and at rest. The cockpit seats are canted to provide back support, the engine controls are out of the way, and the flip up cockpit table makes outdoor dining a treat. Hunter Marine's evolutionary innovation shows in the Hunter 410. Backed by over 25 years of experience, the 410 really delivers. The spacious salon includes everything to make cruising a comfortable experience. Plenty of hatches and ports keep the salon bright, airy and well-ventilated. The highly polished dining table is central to entertaining and serving meals. Elegant fabrics and rich teak combine to create a warm and luxurious atmosphere. A separate navigation station houses all electric controls as well as providing plentiful space for electronics. The aft head includes a stall shower, Corian vanity, and lots of storage. Dual access to the large head keeps it private yet convenient. Aft, there is a master stateroom that features a huge queen berth, hanging lockers, and a host of storage facilities right down to the hanging carry-on closet. Lighting and ventilation is excellent and there is full head room as well. Forward, the full size stateroom has its own en suite head, overhead hatches, and more drawers and hanging lockers than found on much larger yachts. The starboard side galley is very open with large, wide Corian counters, three-burner range with oven, microwave, triple access refrigerator-freezer, trash receptacle, and plenty of storage. Even the dishware and rack are included. Comfort, convenience, and utility were Hunter's design goals and the new 410 meets them head on. Hunter Marine's keel boats are the backbone of the Hunter fleet. 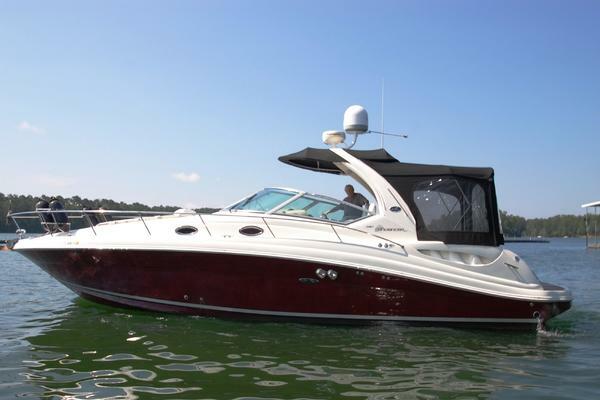 These spacious and comfortable cruisers are incredibly appointed from the rich fabrics to the top-grade hardware. Hunter Marine Hunter Marine Corporation was founded in 1973 to build truly affordable sailboats. Warren Luhrs, Hunter's chairman, has personally logged thousands of ocean miles both single-handedly and shorthanded aboard his ocean racers. From these floating laboratories hundreds of new ideas have been born. The same B & R rig that powered his boats into the record books also power the Hunter fleet. A lot has changed over the years, but Hunter Marine continues its commitment of bringing the sailing public the best performing and most accommodating sailboats at a reasonable price.